It was time for another push of the new sql command line , sqlcl. Here's the changes in the latest build. There are a number of bugs fixed relating to connecting to idle databases, alias feedback, and picking up the $ORACLE_HOME's jdbc driver when available. There is only a couple functional changes. First is that now the jdbc connect string itself can be specified. This opens up a number of options on how to connect. This is list of valid jdbc prefixes. While I've not yet tested it as noted in this list we will be testing loading sqlcl into the DB and trying it out in the JVM there. 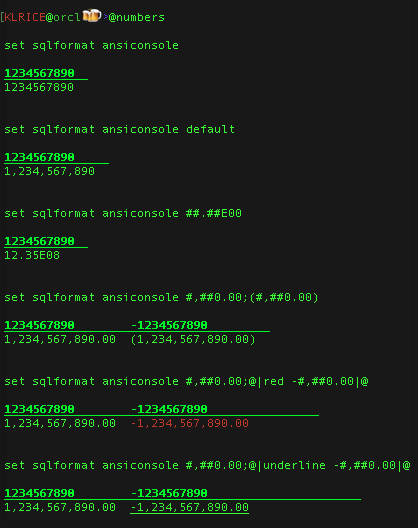 Next is the ansiconsole formatting of numbers was changed up a little. The new syntax as 3 options. One piece of feedback was that the numbers auto formatting with separators made some things difficult. Now just setting the console formatter will NOT format numbers. Instead the default option needs to be specified. Also is the option to specify any number format which has to be in the form of a java format. The syntax can be read here. This script show an example of all the new options. The only caution when using the @|... |@ syntax is that only one thing can be used at a time as the, used to separate the formatting options gets read by the java formatter as a number format. If this is something that folks end up using a lot, I'll come up with something to let it blink and be red at the same time!